The upright vase is 10 1/2" tall and the planter is 10 1/2" wide and 5 1/4". The items are not new. 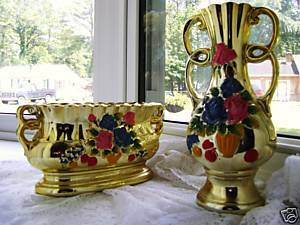 The material is a glass-like painted pottery . The flower and fruit images are raised. Marked on bottom with a blue sticker Japan. Use calculated shipping from zip code 23434. Check out my many vintage items and planters. Combined shipping is offered.Subscribe to my monthly Store newsletter add me to your favorite list.